DermOrganic Intensive Hair Repair Masque 8oz. 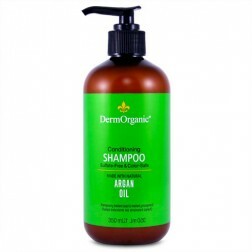 Intensive deep conditioner that revitalizes and repairs damaged hair from the inside out. Masque is ideal for color treated hair and can be used everyday as a quick conditioner. DermOrganic® Masque is an intensive deep conditioner that revitalizes and repairs damaged hair from the inside out. It has unique properties that wont build-up, or over-proteinize the hair, making it safe for everyday use. Hair fiber is made of amino acids. Hairs moisture is primarily derived from lipids. That's why Masque contains a proprietary blend of rice amino-acids inside a lipid-based emulsification. Instead of coating the hair, DermOrganic works deep, depositing amino acids to strengthen and smooth each individual hair from the inside out while replenishing real, natural moisture. Colored, permed, heat styled or sun drenched, DermOrganic® has what it takes to impress your stressed tresses. So gentle, Masque is ideal for color treated hair and can be used everyday as a quick conditioner, and 2-3 days a week as a deep reconstructor. Directions: Apply to clean hair from the scalp to the ends. Leave in 2 to 5 minutes as needed to repair damaged hair, then rinse. Use at least twice a week. On other days, quickly rinse through hair as a daily conditioner.